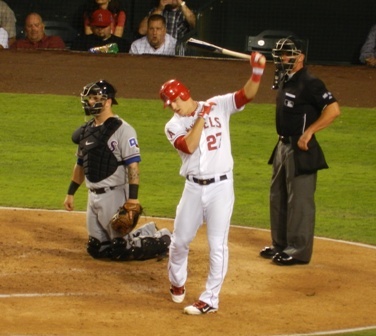 A Tale of Two Angels Teams…Again? It was the best of games, it was the worst of games. (Well, okay, not really even close to the worst of games, but go with it. She’s rolling.) A large offense ably supported a fair haired pitcher’s strong milestone outing on the mound for Monday’s game. That same large offense plainly failed to support a dark haired pitcher’s equally strong start for Tuesday’s game… and the comparisons to 2010 and ’11 could only be meet with invective. Okay, now we’re starting to veer into Fraser Crane’s rousing ATOTC/It/Rambo mash up territory and, quite frankly, I can’t hope to compete with that level of awesome, so we’ll just stop right here. But you get the general idea. There are two Angels teams here and that’s nothing new. I seem to find myself writing this same thought every April about this time on this blog or in other forums, in good Angels years and bad. Both teams have good starting pitching most of the time. The difference lies in how they support that pitching. And any time the bullpen, the offense or the fielding from that other Angels team appears, victory becomes a lot trickier. Any time more than one of these components appear together, look out. 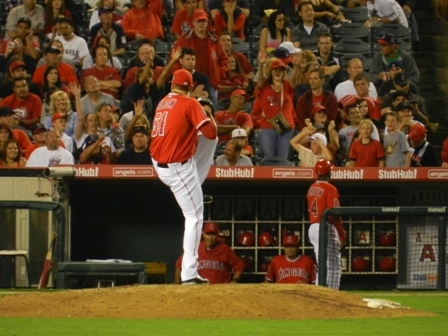 All indications are that we should see far more of Monday’s Angels team – you know, the good one – than Tuesday’s “other” Angels team this season, especially as our starting pitchers stretch deeper into the game and tack on their usual high number of complete games. But I’d be lying if I said I didn’t greet last night’s 2011 homage of a bullpen meltdown on top of a measly 2-1 lead with some invective of my own. I mean, come on, Kevin Jepsen has always been reliable for about two out of three outings – which did lead me to conclude loudly that Kevin Jepsen is How I Met Your Mother’s naked man. And even I can tell you which Jepsen it’s going be by the second batter. 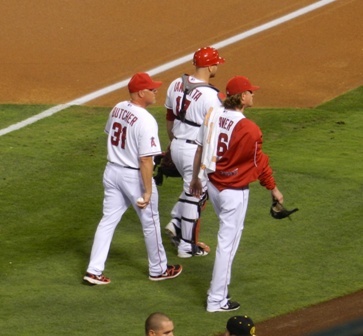 Butcher and Scioscia certainly should have been able to tell this was time one out of three and relieved him with that day’s more effective arm. Our seats for Monday night’s game were just to the foul side of the foul pole down the first base line, in the second row. Prime visitor’s section this. And, indeed, we set in front of and behind two families of Nationals fans vacationing in Los Angeles and next to a Phillies fan and his young daughters who were here on one of the middle stops of a larger baseball tour vacation. They had just come from Seattle and were headed out to Arizona then Texas. So jealous! When everyone has the right attitude, visiting fans can be a kick to enjoy the game with and all parties involved in this particular case were really nice and a lot of fun to chat/snark with. Bobby Abreu leads off of second. Being on the field level, these seats were excellent for catching glimpses of personality on the field, some of which I got on camera. As you can see, Bobby is a talker on the base paths, especially at second base. He always wears a huge smile and gestures broadly with his hands so it is unclear for the most part if he’s goofing around, talking trash, just shooting the breeze or what. Probably a little of columns A, B and C. What little I catch of it on TV is pretty darned funny…and of course he has 13 stolen bases (not bad for one of the few ballplayers left who are older than me :)) so perhaps this is all part of his strategy. Get ‘em laughing, then break for third? Vernon Wells at bat. These seats were not, however, the best for views or photos of the plate. 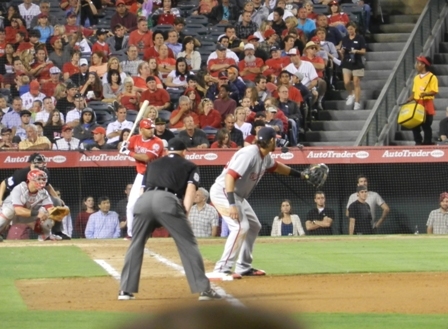 The first base umpire is always in the way. That’s okay. Ssometimes I enjoy having a closer vantage of the outfield and plays at second. Wells is continuing to heat up in June. He hit a single this at bat, which eventually lead to a run and then went four for five on Tuesday with a crucial two-run homerun. And Angels fans are starting to respond. Both developments are very welcome indeed. Catcher Bobby Wilson and Pitching Coach Mike Butcher meet with Ervin Santana on the mound. Santana got off to an uneven start, giving up homeruns in the 2nd and 4th, but settled into a good rhythm after that. He lasted eight innings and on the Angels, starters don’t pitch in the 9th inning unless they’re pitching a shutout or something equally spectacular, so that’s pretty darned good. 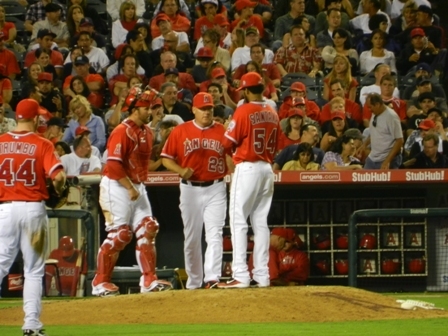 Just a random shot of the Angels bullpens. The bullpens at the Big A are terraced, which is a little unusual. 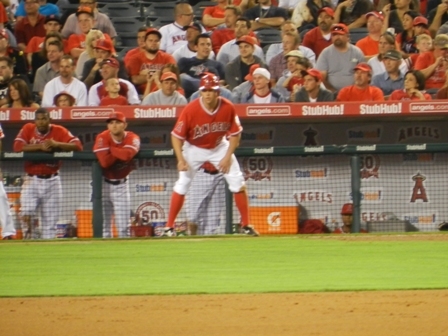 The Angels bullpen on the lowest “step” in the front. And if you look at the photo you can see the Nationals in the visitor’s bullpen one step up and behind the home bullpen. Starting another “step” above the visitor’s bullpen you have the Left Field Pavilion seats. 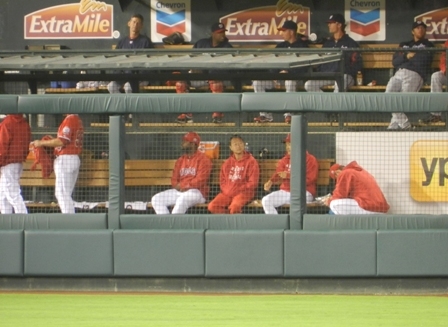 In this bullpen shot you can see Angels relievers Michael Kohn (standing up), Fernando Rodney, Hisanori Takashi’s translator, Hisanori Takashi and Jordan Walden kneeling down and…what? Praying? Vomiting? Spitting sunflower seeds? Catching a few ZZZs? Probably the real answer isn’t nearly as funny so I’m going to go with one of mine. 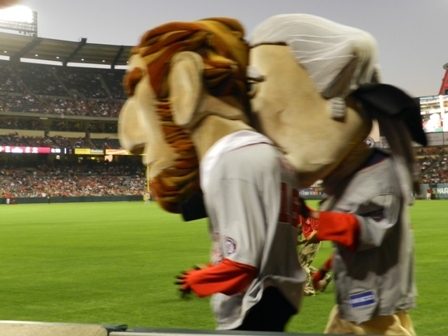 The Nationals brought the Racing Presidents with them to Anaheim for the series. So was this a) an incredibly stupid idea, b) a fine example of Interleague sharing of baseball cultures and traditions, or c) I really hate Interleague and fail to see how these two comments are mutually exclusive? You make the call. I initially thought the idea was kind of dumb, only because this is the Nationals’ tradition and it’s the Angels ballpark. 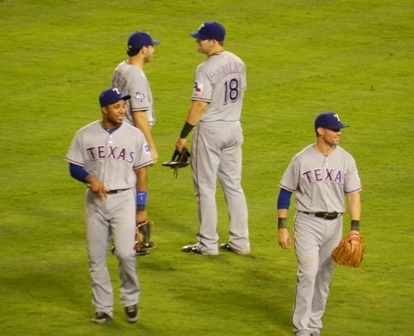 But it was kind of fun to see and it provided a between innings icebreaker with the Nationals fans around us. I took the opportunity to ask, so, what’s the deal with Teddy? He’s really never won? I mostly knew the answer, but it was fun hearing all about the goofy, fun tradition from fans. We’d been talking a little between innings before that, but talked a lot more often after: relievers we love/who make us cringe, hitters who are starting to do better than their batting average indicates, overinflated contracts…it turns out Angels fans and Nationals fans have a frightening amount in common. 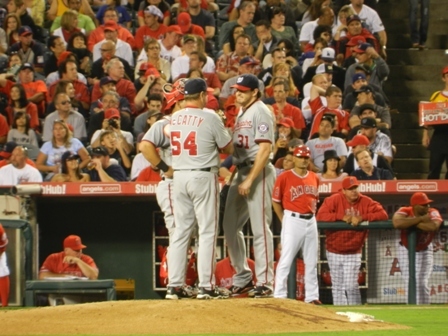 Nationals Catcher Wilson Ramos and Pitching Coach Steve McCatty meet with Pitcher John Lannan on the mound. 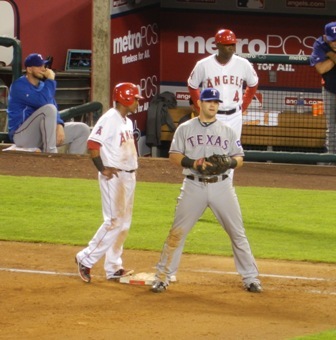 All was going well for Lannan and the game was tied 2 to 2 until the Angels started hitting in the 6th. 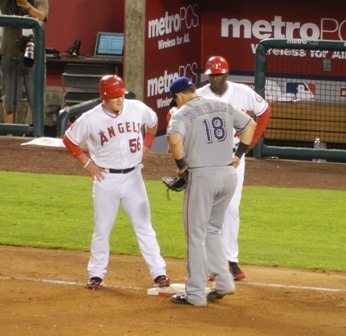 The Angels scored their third run shortly after this meeting and then Lannan was pulled. I love the photo because of the facial expressions and body language. I can only imagine the conversation that went with it. McCatty: Alright then, how are we going to get out of this? Lannan: Well, gee I don’t know Coach. I thought maybe I’d throw some strikes and get him out. Mark Trumbo grows impatient during the meeting on the mound – again, with being able to catch glimpses of personality from these seats. 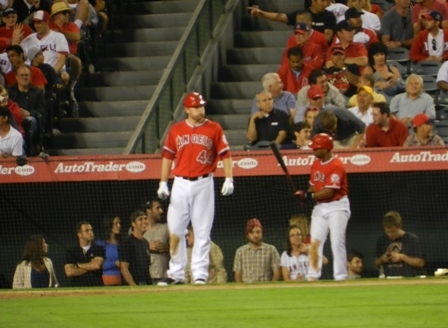 Mark Trumbo is usually as professional in demeanor as a veteran so I was amused to see him visibly impatient at another break in this already lengthy at bat, with his cheeks puffed out like an exasperated little kid. Very cute actually. He ground into a double play this at bat, but was pretty solid at the plate this series. His average is creeping back up again and he is the American League’s rookie homerun leader with 13. Coincidentally, the Nationals’ Danny Espinosa is the Rookie Major League homerun leader. 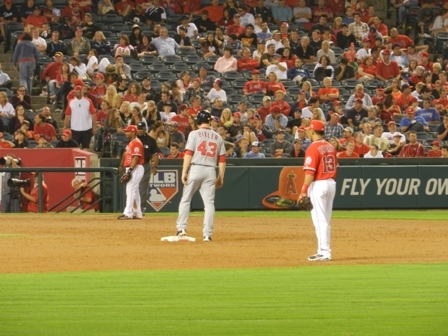 The Nationals outfielders, Roger Bernardina, Laynce Nix and Jayson Werth meet during the subsequent pitching change. ‘Damn Werth, you have lots of friends over here too. 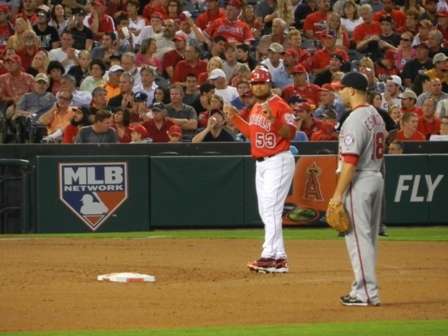 You’re a real popular guy in Anaheim.’ Suffice to say, Angels fans were heckling Werth all night, which isn’t surprising. There are a few folks I see regularly in this section and the left most corner of the right field MVP section (Season ticket holders? Maybe, maybe not.) who heckle pretty much everyone, occasionally even our own players. Whether or not that was the topic of the outfielders’ conversation, I’m sure Werth is used to it by now. Peter Bourjos and Vernon Wells joke after Peter snags a fly ball to end the inning. The outfield chemistry is shaping up much better as the months role by. This is very helpful, especially with various assorted centerfielders, corner outfielders turned DH and the occasional second baseman flopping roles in the outfield on a regular basis to accommodate injuries, Interleague and random acts of lineup juggling. Yes that is Torii Hunter right in front of me in right field. The news report prior to Monday’s game was that Torii took batting and fielding practice Monday and looked good enough to return soon, possibly as soon a Wednesday. Imagine our delight when they brought him in as an unexpected substitution in the top of the 8th inning. The whole crowd erupted and we went especially crazy in the seats around right field with our welcome backs. Jorda Walden takes the mound in the 9th. Unfortunately this would prove to be another blown save for Walden, his third in a row, when he gave up a two-out homerun to Danny Espinosa. The young Nationals fan in front of us turned around and informed me “Blown Save”. Thanks kid, I kind of figured that one out on my own. No liner notes needed. So, am I worried about Walden? No. Not at all. When I started advocating making the rookie our closer, I knew there would be some growing pains. This is a kid who had every intention of being a starter and never thought about the closer’s role until it turned out he had quite the aptitude for it this season. So far, he has 18 saves (including last night’s) which is respectable. And when he does blow it, instead of crumbling, Walden is right back in the game to get the next batter. Monday night when he gave up the homerun, he threw the next pitch for a called strike and then coaxed the batter into a ground out to end the inning. And he was right back in the game on Wednesday night with a 1-0 lead on the line and got the save. That says something to me. We will probably witness a few more growing pains this season, but I have no doubts that Jordan Walden is our closer. Scott Downs pitches in the 10th as Howie Kendrick (who moved to first base in the 8th when Torii came in to the game) moves into position. I mentioned we were chatting about relievers with the Nationals fans? Well, Scott Downs is one of the few I never worry about. When I look over to the bullpen and see Downs warming up, with that distinctive haircut easily identifiable across the field, I breathe a sigh of relief. Yes, he has an off outing here and there, but by and large he comes in and gets it done and he has five wins for the season, as many as some teams’ starters, to prove it. Monday night and the rest of the Nationals series was no exception. Brian Bixler stands on second flanked by second baseman Maicer Izturis and third baseman Alberto Callaspo. Bixler reached 2nd on an uncharacteristic fielding error by Maicer. 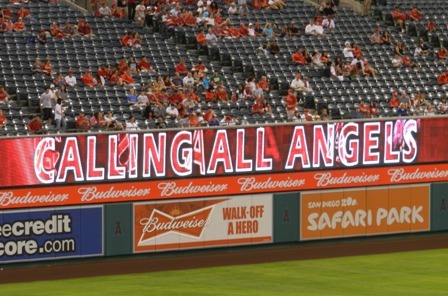 There were an annoying number of Angels fielding errors this series actually, but we recovered from all of them to sweep. I hope the errors are more an indication of tiredness from the epic Four Corners Road Trip than anything more trend setting, shall we say. This is a very simple game. You throw the ball. You hit the ball. You catch the ball…except when it’s pouring rain and even making the simplest of catches or making contact with the fattest of meatball pitches can become fodder for a Keystone Cops remake. So Friday’s 4 – 3 victory against the White Sox was interesting, entertaining, maddening at times, and very, very wet – seriously, my hat is off to all of those tough Chicago fans who stayed for the whole game – but ultimately a win! 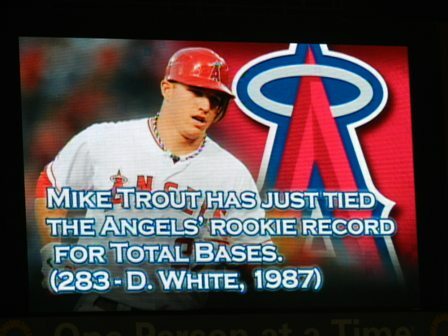 This breaks the Angels seven game losing streak against the White Sox which makes me very happy indeed. 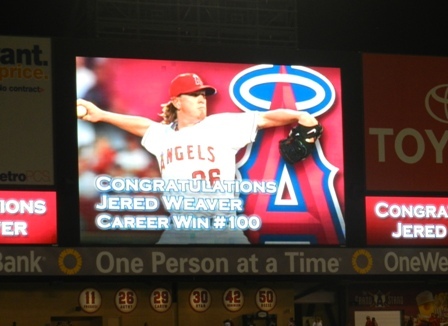 Jered Weaver did not have one of his better games but a less than great start for Weaver is still a pretty darned good start in the grand scheme of things and, when the Angels give him run support as they did last night, is usually enough to secure a victory. I was a little worried in the third inning, after he gave up a handful of hits and the infield and outfield each blew a play in rain aided, blooper reel worthy fashion. But then he stalked, nay stomped, off the mound with a string of curses at himself that required no lip reading expertise to interpret and I knew we’d be okay. 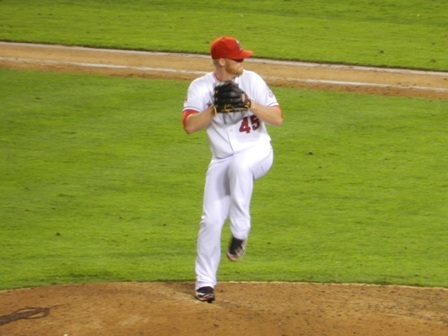 When Weaver gets angry, he usually channels it back into the pitching with wicked effect. The Angels still need to work on RISP and some guys had quiet bats, but Maicer Izturis was on fire, going 3 for 5 with a two RBI double. Mark Trumbo continues to hit well. Vernon Wells found his bat for the second game in a row and Peter Bourjos continues to show how speed can create a hit where you didn’t think one was possible. I got a kick of Mike Scioscia and Mike Butcher basically overriding the umpires’ second, hesitant, rain delay call in the bottom of the ninth, sending the Angels back out into the field to warm-up and even tossing Jordan Walden a baseball themselves until the umpires changed their mind and told the grounds crew to stop rolling out the tarp they only just wrestled into position. 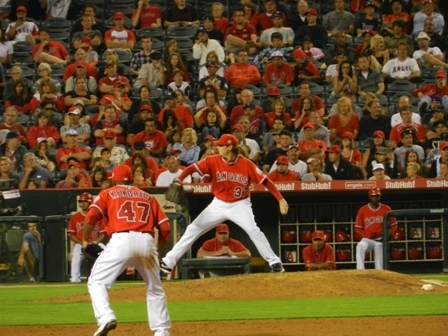 So, about the Angels’ bullpen? I am sitting here icing my knee after the Saturday edition of my thrice weekly beating as I type this and I. Hate. Ice. Hate it. I do the ten minutes on, ten minutes off thing for an hour several therapist friends recommend because I can see the therapeutic benefits, but it never fails. The burn gets so stabbingly painful that I want to start clawing the furniture and chucking the ice bag across the room at nine minutes on the dot. Every. Single. Time. And, yet, I still think I would rather spend large parts of the 8th inning in a complete ice bath than watch Fernando Rodney play 8th inning set up guy again. I keep hearing how much Rodney has improved since he adjusted his mechanics but I am not seeing it. No, he didn’t allow a run, but he walked a guy and allowed a hit and we had to get the last two outs with runners on 2nd and 3rd. But, he got out of the inning and then Jordan Walden went one, two, three. It’s a wonderful new feeling to have a closer who closes. Even with the rain abetted clumsiness and eight inning drama, it was a fun game to watch and this Friday saw the “season premiere” of Seth’s and my Friday Night Ritual – a nice dinner, a good bottle of wine and the Angels game, usually on delay so our commutes dont deny us a single pitch. This Fridays spread? Gourmet a’la lazy chefs – crostini with pea mint pesto or mushroom tapenade, prosciutto and apples with Chronic Cellars’ excellent red blend Sofa King Bueno chosen because the Chronic guys aren’t lying. The wine really is Sofa King Bueno. And now the ice is finally off my knee – Yay!!! – and I am ready to enjoy watching what the new kid can do on the mound in his second start. Play Ball! …when the rain stops of course. 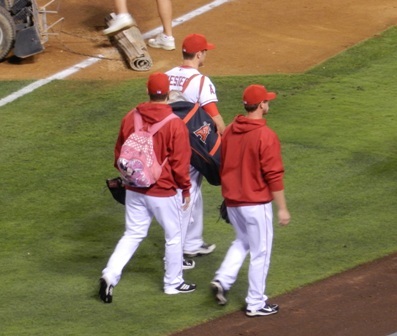 Angels Spring Training News is a Mixed Bag…of Surgeon’s Tools? Spring Training is but a few days old and the MLB reporters, probably just as bored and jonesing for real baseball news during the winter as the lot of us, are eagerly taking in every detail and flooding the newspapers and websites with articles, much to my delight. The only downside to this? All of the dire Kendry Morales speculation. It was pretty much a given it would start as soon as he reported to Spring Training. According to reports throughout the winter, he resumed light baseball activities in December and began light jogging about a month ago. This is excellent, hopeful progress but it never sounded like Kendry would show up in perfect, healed condition ready to go full bore on day one of Spring Training. Depending on how quickly the doctors clear him to start running at full speed again, it sounds to me like he could make the Opening Day roster but this isn’t a definite. Suffice to say, I was prepared to have this news confirmed, and it has been in several articles now, but even when expected, it’s still disappointing. The about face in the reporters’ tone from a cheerful one midway through the post season to extremely cautious now just tells me that on some level they’re big baseball fans too. They were hopeful and rooting for the guy over the winter and are little disheartened now and all of that comes through in the tone of the prose, even when they don’t intend it to. In the articles, Kendry himself sounds a little down about it but reading between the lines, I think things still sound hopeful. He’s hitting very well and feeling no pain (yay!) but says it still feels tight and unflexible and he can’t run with more than 1/2 speed right now. I actually know that one, to a much lesser extent. I have spent the last year finally properly rehabbing a knee I damaged repeatedly in my youth and again as an adult (the last time racing up hills on my bike with clips on my shoes – it was great…until it wasn’t) and I remember the stiffness and inflexibility seeming insurmountable until all of the sudden, and quicker than I would have thought, things improved by leaps and bounds. I hope the experience is comparable because, if so, Kendry could be in playing shape by Opening Day or soon after. If not, well, I don’t really want to think about that right now, with our best first base substitute reporting for Spring Training in Surprise, AZ, this week instead of Tempe. Howie Kendrick was not my favorite substitute first baseman last season by a long shot, but I think he’s the best temporary option, unless Mark Trumbo has improved a lot over the winter and this I doubt. 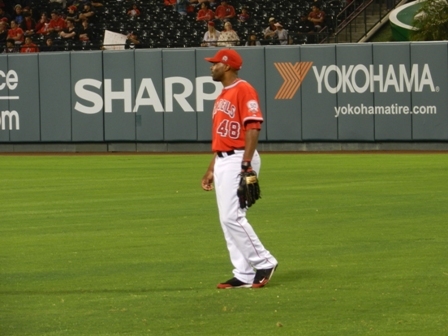 Then Callaspo could play third and Maicer could play second, as long as he stays healthy. It could work, but I hate to start out the season with a duct taped infield, even if it’s only for the first month. Reading the rest of the news, several other Angels apparently spent the winter in various forms of surgery and rehabilitation. 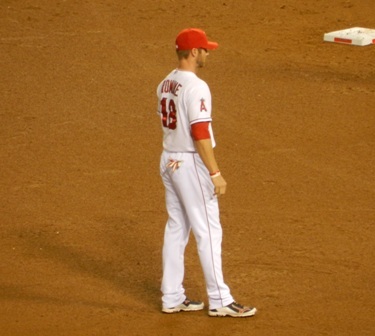 I was aware Erick Aybar had surgery to repair the knee damaged when Casey McGee busted up the double play back in June. He sounds excited by his progress and I hope that between fixing the knee and no longer dealing with the pressure of batting leadoff, he is able to return to his 2009 form. But Matt Palmer was a surprise. While continuing conditioning workouts this winter after the surgery on his clavicle last season, he discovered he would need knee surgery as well. Apparently they rebuilt him. Better. Stronger. Faster. And Palmer feels the end result has improved his range and delivery considerably. Yay! That’s the kind of news I like to hear! Pitching Coach Mike Butcher was another surprise but, again, with a positive ending. He had surgery to remove a cancerous tumor from his thyroid gland over the winter. 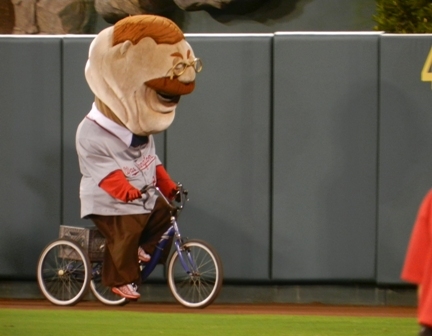 All reports say the surgery was successful and Butcher is on the mend, though not attending the first few days of Spring Training. I wish him a full and speedy recovery. So, do all of the winter improvements and repairs mean a stronger Angels team or another season of duct tape solutions and cobbled together Franken-infields? Time will tell but I actually believe it’s the former. One thing is for certain, one way or the other I’m in for a lot of news about it in the coming days and that is already a huge improvement over the offseason.